Shane Victorino was born on Sunday, November 30, 1980, in Wailuku, Hawaii. 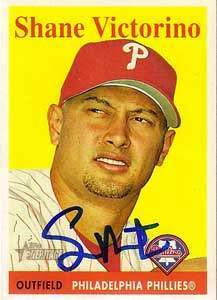 Victorino was 22 years old when he broke into the big leagues on April 2, 2003, with the San Diego Padres. His biographical data, year-by-year hitting stats, fielding stats, pitching stats (where applicable), career totals, uniform numbers, salary data and miscellaneous items-of-interest are presented by Baseball Almanac on this comprehensive Shane Victorino baseball stats page. Shane Patrick Victorino was a Major League Baseball player for the San Diego Padres (2003), Philadelphia Phillies (2005-2012), Los Angeles Dodgers (2012), Boston Red Sox (2013-2015), and Los Angeles Angels of Anaheim (2015). The Flyin' Hawaiian, his nickname, was the first Hawaiian -born non-pitcher sent to an All-Star Game ( 2009 ) ! Did you know that when Shane Victorino hit a grand slam during Game 2 of the 2008 National League Division Series (on October 2, 2008 ), it was the first of his career, and the first one ever hit in a Division Series by a Philadelphia Phillies player? Did you know that when Shane Victorino finished the 2013 regular season, he had 18 sacrifice hits, 15 home runs, and 21 stolen bases - the first Boston Red Sox player to collect at least 10 sacrifice hits, 15 homers, and 20 stolen bases in a season?